Good evening ladies and gentlemen! I wish all good health and good mood! 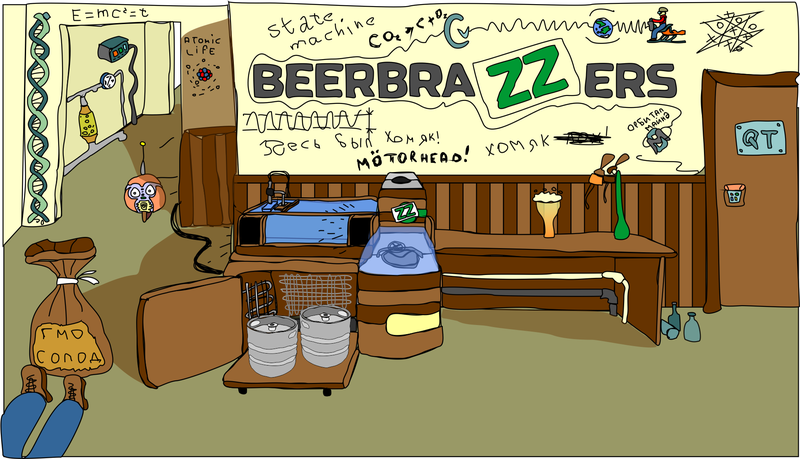 Now I will start a cycle of ten articles devoted to the development of the BEERBRAZZERS brewery. It is not recommended to treat this cycle seriously. It's all for fun and, as they say, purely for fun. The first article will deal with the management of light under music. Indeed, where in the brewing industry without it? Anywhere. And if so, let's proceed. Actually, what are we talking about? Many of you probably know that in the states everyone is fanatical from decorating their grounds for Christmas with various garlands, lamps, diode cords and other lighting products. There it is, sometimes, the nature of a special Olympiad - a kind of measurement, who has a longer garland Of course, there are a lot of different lighting effects: synchronous on /off, smooth increase /decrease in brightness, all sorts of running lights and so on. But the special glamor is the synchronization of your light show with music. If someone does not understand what they mean, then you can look at this kind of vidos, and everything will become clear. You can download the latest version of "Fox" from the official website. The program is free. Let's rejoice. However, it works only with Windows. We shall be immersed. 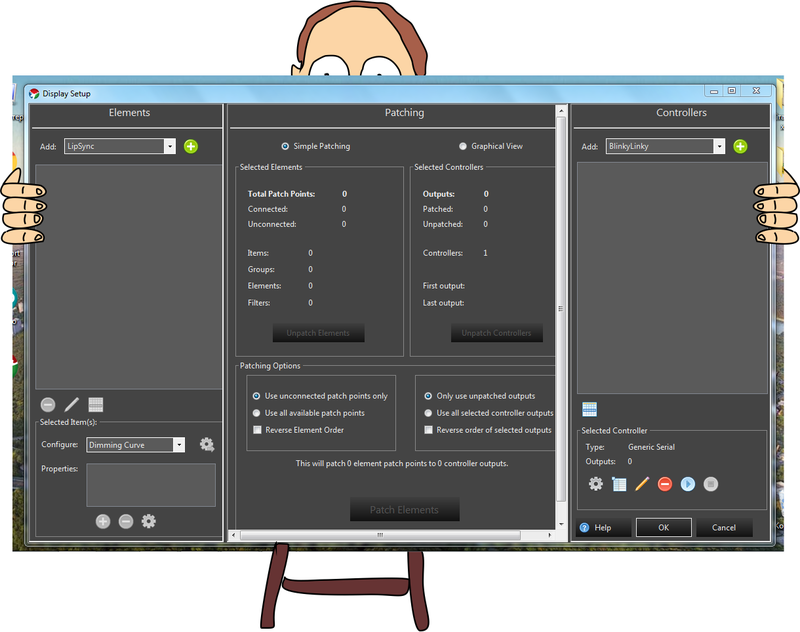 Choose a launcher in accordance with the bit depth of your operating system. A limitation applies to the 32-bit version - you can not create more than 2000 (!!!) channels. But believe me, 2000 channels - this is very, very much dofiga. I doubt that anyone will need so much. Although Downloaded? Run it! At once there will be a window of greeting. After installation, uncheck Show readme and click Finish. In the process of installation there will be a small pause with a minute, this is so necessary, nothing hanging, do not be nervous. In the Recent Sequences field, you will not have anything. But now it's more attentive. We can not create sequences at once, because we first need to make the settings. The first thing we need to do is add elements. The element is your light source. LED, incandescent lamp, neonka anything in general. We will add six sources. Three of them will be normal (turn on /off /blink), and three with adjustable brightness. This division is conditional, just for example. You can make all adjustable if your controller has enough PWM pins, at this stage it does not matter - the settings in both cases are the same. At the top left click on the "Add" drop-down list and select Single Item. Then press on the green plus sign beside it. A window will pop up at once, in which you must specify the name of the element. We have this Lamp 1. Ok. Similarly, we make 5 more sources. You can call anything, the main thing then to understand that where, if you have different sources, then call it Led? Led? Lamp? Lamp2 and so on. When the sources are added, you need to add a controller.
. In the Controllers window on the right, in the "Add" drop-down list, select Generic Serial and click +, then specify the name of our controller - we have UNO, because we will process the data using Arduino Uno. Why? Probably, because now they have more users than users of the hub. You can use what you prefer, the main thing is that it can skilfully read data from the com-port. Well, you can write anything instead of UNO, at least "Bormatozavr" - if only you were satisfied! Immediately after specifying the name, a window will pop up, in which you need to specify how many channels will be used on the controller - we set six by the number of light sources. To the left we have 6 light sources, 6 channels to the right for control. But they are not connected (gray color). To link, you need to select all sources and all channels using ctrl or shift, and then click on the Patch Elements button at the bottom in the middle of the window. The notification will pop up, saying everything is patched, everything is nishtyak, well done, after which all the elements and channels will turn green. Okay. Let's go further. 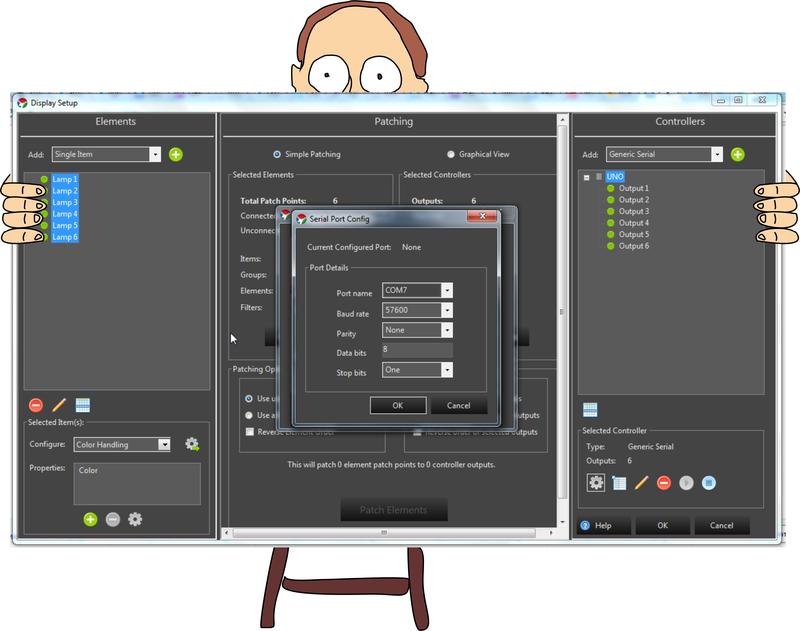 At the bottom left there is a list of Configure. We select Color Handing there and click the gear with the arrow on the right. Choose the last option, and leave the Color Order RGB. The confirmation windows will pop up - we click everywhere OK. This is in reserve, so that later you can play with RGB LEDs. Now you need to configure the settings for the serial port. To do this, you need to open the port, for example simply by connecting to the Arduino computer (if you have Arduino IDE installed and if you need a driver for the USB-UART converter in case of some Chinese cards). If the port is not open, then the settings will not be executed. So, we connect Arduino, then we click on the right from above on the name of our controller (UNO) and at the bottom click on the gear. The com-port settings window will pop up. We put the Send a text header checkbox and enter two symbols, not numbers, but something that is not normally used, for example "+>" without quotes, of course. It will come in handy when we write a sketch. In the Port Name field, your port (COM7) is defined, it can get up automatically, and sometimes it's necessary to select it from the list. Also, if you have more than one port, select the one that corresponds to the connected Arduino card. After disconnecting the card and then connecting it, it can change - every time you start working, check this point - it can fairly spoil your nerves. In the field Baud Rate select the communication speed, the more light sources, the more speed you need to choose. I've always had 11520? 9600 for this example. But we'll put 57600. It's important to set the port on arduino exactly the same bitrate, otherwise nothing will work. Carefully refer to this point. We press everywhere OK. Click again on the right at the bottom. Done. We set up Vixen Lights to work with six light sources. This concludes the first part of the first article. If on Arduino you have a faint blinking RX LED - then you did everything right. In the second part, we collect the obvzyak for Arduino, so that in the third part you can see the result of your torment. P.S. That there was no rake. 2. Connect to the computer Arduino, give her time to come to, blink, cough. 3. 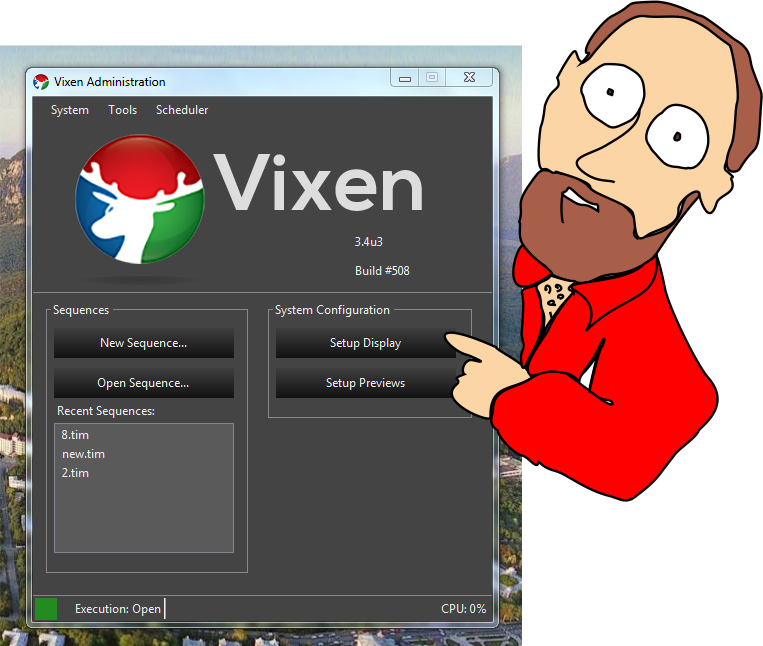 Run Vixen, after the start window appears, the RX LED on Arduino should start blinking rapidly. 8. Check the port number> click OK> OK> and again OK to the right at the very bottom. 9. 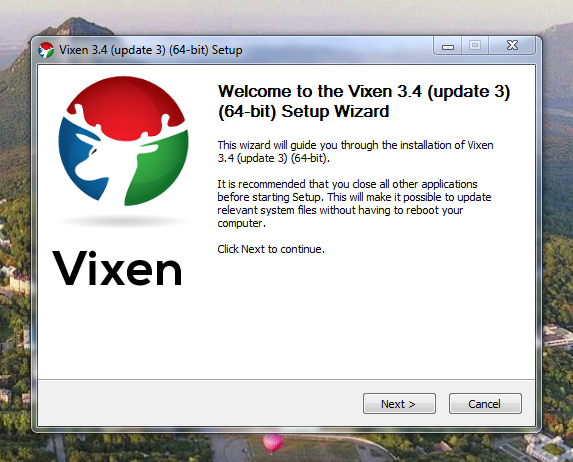 Close Vixen, open Vixen. Will we arrange a formal red beaker for beer from the World Cup after the publication of the next part of the article? Let's after the publication of all parts of the article, and then you will write two parts and again for 5 years will disappear! And what will it take to get such a glass? 5 people have voted. Abstained 5 users.